Newspapers have lost nearly a third of their share of the advertising market in the last four years, with the dollars – no surprise here – shifting to the online and mobile media, according to a new study from eMarketer, an independent research company. The decline in newspaper ad share – which is far deeper than drops in the other legacy media in the same period – appears to be a direct response by marketers to an even sharper decline in the amount of time that consumers spend with print newspapers. The eMarketer study, which was released last week, clearly demonstrates the economic impact of the shifting preference among consumers for the individualized experience and instant gratification delivered by the digital media. :: The percentage of Americans who read a print newspaper has fallen to 23% today from 41% in 2002, according to the Pew Research Center. 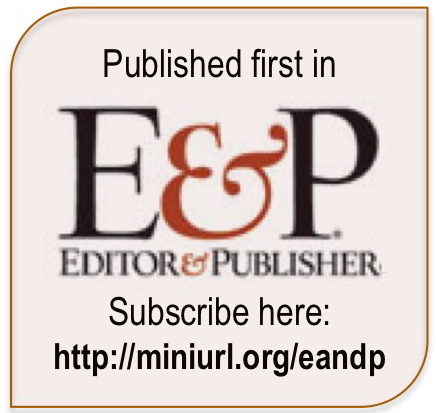 :: Newspapers have been particularly unsuccessful at attracting readers under the age of 55. As reported previously here, a survey by the New York Times Co. found that 22% of 18- to 34-year-olds read print newspapers and 34% of those aged 35-54 favored print. By contrast, 53% of the over-55 cohort still used newspapers. The eMarketer study adds another dimension to the discussion, showing the way ad dollars are following audiences. In surveying media consumption annually since 2009, eMarketer found that consumers this year are spending 3.1% of their media time with print papers, as compared with 5.1% in 2009 – a drop of 40.4% in engagement in four years. The survey includes multiple media use when people multitask; thus, eMarketer counts the time that people spend perusing a newspaper while also listening to the radio or watching TV. 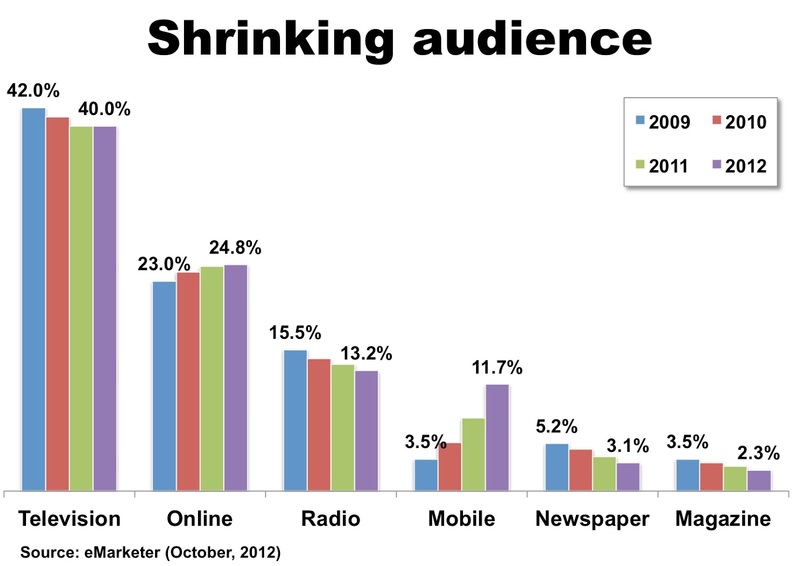 As illustrated in the first chart below, the newspaper audience has contracted faster than those of magazines, radio and television. The TV audience remained the most stable among the legacy media, falling 4.8% in four years, while radio slid 14.8% and print magazines dived 34.3%. At the same time engagement with the traditional media has contracted, the use of online media advanced nearly 7.8% and the use of mobile media soared (from a low starting point) by 234%. The time spent on mobile media, by the way, does not include telephone calls. Not surprisingly, ad dollars are following consumers. At the same time newspaper ad spending fell by 31.5% in the four-year period, online ad expenditures grew 37.5% and mobile ad outlays rocketed 433% (again, from a low base). Among the legacy media, TV ad spending grew 6.6% since 2009, while radio fell 4.1% and print magazines slid 12.4%. 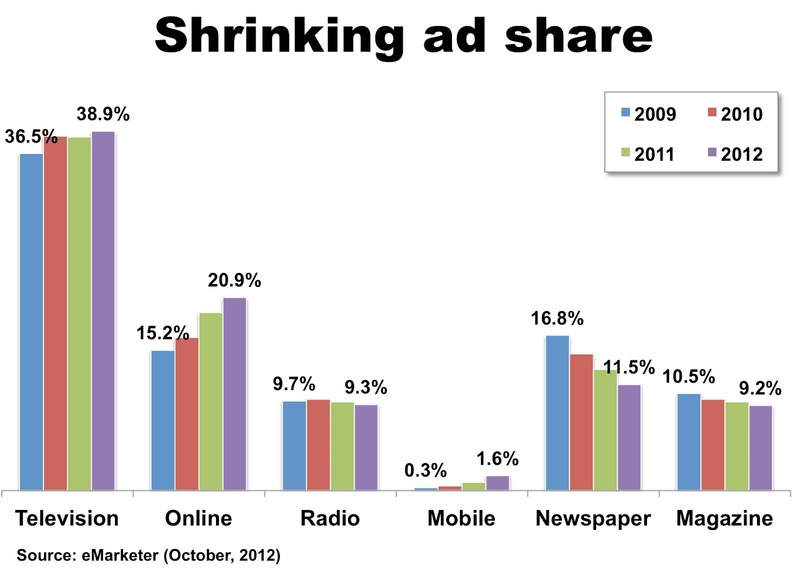 The good news for newspapers in the above data is that they have clung to far more advertising share than their share of audience would seem to warrant. While newspapers today have only 3.1% of the media audience, they are getting 11.5% of the ad revenues. The bad news for publishers is that markets tend to be rational, correcting such imbalances in the fullness of time. The plunge in newspaper ad sales from $49 billion in 2005 to $24 billion in 2011 – a decline that has continued unabated all of this year – indicates the market is behaving as anticipated. With the objective evidence suggesting that the newspaper business is living on borrowed time, publishers should be using their residual economic power, brand power and marketing power to develop new digital products to protect and sustain their valuable franchises. Or else. Once the definitive mass medium, newspapers – in both their print and digital incarnations – have shrunk to being niche players in the typical market, according to a number of must-read research reports released in the last few weeks. As detailed in a moment, a steadily accumulating body of research shows that consumers are using computers, mobile devices and even Facebook to shop actively for news and information. While the research shows that newspapers have slightly more market clout in small and isolated communities than in cities and suburbs, the trends all point in the same direction. Although publishers in small and medium markets have slightly more time to adapt to the digital revolution than their metro colleagues, the challenges causing the New Orleans Times-Picayune to abandon seven-day print publication will affect all but a few outlier markets in the fullness of time. ∷ The number of people who used a print newspaper in the last week to get local news ranged from 36% in metro areas to 42% in small cities, according to a study released in late September by the Pew Research Center. The survey found that newspaper website consumption was weaker than print, with use running from 31% in metro areas to 20% in smaller markets. By contrast, the reliance on local television broadcasts was 65% in metro areas and 72% in small cities and rural markets. The use of TV websites ranged from 27% in big cities to 21% in small ones. ∷ In a second study released this month, Pew found that 44% of Americans own smart phones and 22% own tablets, the latter of which, incidentally, represents a doubling of tablet penetration in just one year. After accounting for people who had both types of devices, Pew reported that fully half of the population has some sort of mobile device – and that two-thirds of this group uses their wireless devices to surf for news. Pew reported that news consumption was the second most popular mobile activity after email. ∷ In its September study, Pew found that, notwithstanding some variances based on market size, roughly two-thirds of consumers go to three or more sources for local news each week. “Urban and suburban residents also use a wider variety of local news sources on a regular basis,” said Pew. “Close to half of urban (45%) and suburban (51%) residents use a combination of traditional, online and mobile local news media to get their local news, compared with 38% of those living in small cities and 27% of rural residents.” So, audience fragmentation is well under way. ∷ The sharp generational divide in newspaper readership is illustrated in a national study released earlier this month by a research unit at the New York Times. While 53% of the Boomer generation (those 55 and older) said they read print newspapers, only 22% of Millenials (ages 18-34) and 32% of Generation Xers (ages 35-54) used the medium. 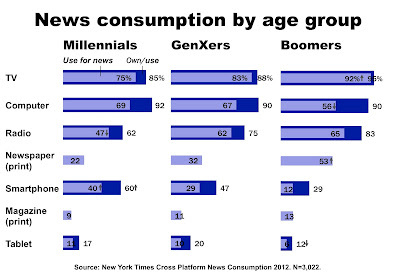 As illustrated below (click to enlarge), online news consumption is reasonably consistent across all ages, but smart phone use is far higher in the younger cohorts than among Boomers. :: Another dimension of the generational divide is illustrated in a study produced in April by Burst Media, an ad-targeting service. The company found that Facebook ranked second only to news sites as the place where sub-Boomers consumed political news. While 44% of Millenials used news sites for political information, 22% of the cohort used Facebook and 17% used YouTube to learn about politics. At the other end of the spectrum, 53% of Boomers relied on news sites and only 8% used Facebook and 7% used YouTube. The usage pattern for GenXers was 49% for news sites, 12% for Facebook and 6% for YouTube. Assuming young’uns don’t suddenly ditch their Droids in favor of print, publishers hoping to maintain the value of their franchises must invest aggressively in broadening their audiences and revenue opportunities beyond the narrow confines of their existing, monolithic, and increasingly fragile businesses. While this admittedly is easier said than done, the alternative to a profound commitment to strategic audience development is to let readership and revenue shrivel to the point that the costs outweigh the benefits of being in the local news and advertising business. Based on the 6.6% drop in newspaper advertising revenues in the first half of this year, industry-wide sales likely will be no better than $22.5 billion in 2012 – or less than half of the industry’s peak production of $49.4 billion in 2005. 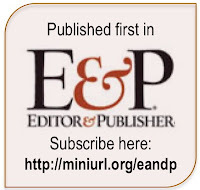 While Borrell Associates (which, like most of us, is not always perfectly prescient) bravely has predicted 0.5% growth in newspaper advertising next year and further gains in the low single digits in the out-years, publishers should not be beguiled by any bounce occasioned by an improving economy. Unless newspaper companies find ways to connect to younger audiences, there is a clear and present danger that they will be marginalized to the point of irrelevance. For those who think phony photos originated in the Age of Photoshop, there is ample evidence to the contrary in a new show at the Metropolitan Museum of Art in New York. Titled “Faking It,” the museum has assembled nearly 200 examples of photos that were manipulated via airbrush, multiple exposures, darkroom derring-do and other means to appear to be something other than what they were. The show, amusingly, is sponsored in part by Adobe, the maker of – you guessed it – Photoshop. An excellent example of news photo fakery in the show is the picture (below, right) of Elvis Presley, which was doctored by an artist for United Press International to substitute a buzz cut for the singer’s trademark pompadour when The King was drafted in 1957. 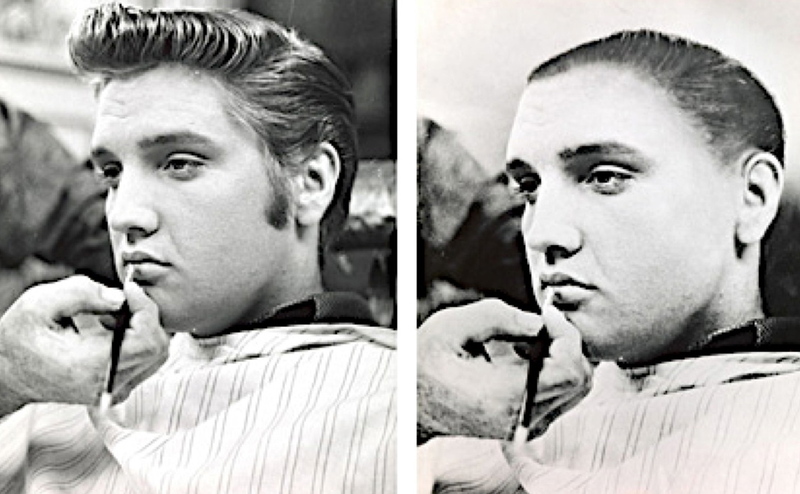 The actual makeover was less severe, as this seemingly legitimate photo attests. While the UPI image probably wasn’t meant to deceive anyone, the history of photo fakery in journalism is as old as the medium itself. The old-timers I met as a young newsman in the 1970s told me that the Chicago newspapers used to, ahem, re-imagine the scenes of high-profile crimes in what were called “Pictographs” that were ginned up in newspaper photo studios. In a typical example of the genre, I am told, a photographer would simulate the scene of a high-profile murder by snapping a picture of an attractive model in an alluring outfit who was sprawled sensuously on a sofa and drizzled with Hershey’s syrup to simulate blood. The syrup was said to photograph better than ketchup in black and white. No discussion of the ancient excesses of Chicago photojournalism would be complete without the tale of the “Lipstick Killer,” William Heirens. After confessing under extreme duress as a teenager to a trio of gruesome murders, Heirens spent 65 years in prison before dying behind bars earlier this year. When former BBC boss Mark Thompson starts work as the chief executive of the New York Times Co., he will become the highest-profile example yet of an emerging trend among publishers to hire leaders from outside the newspaper business. The idea of recruiting outsiders is a radical departure for an industry that historically was a closed fraternity dedicated to promoting and hiring from within its tightly sequestered ranks. For the many decades that newspapers chugged along reliably and profitably, this worked just fine. But the 50% plunge in advertising sales in the last six years has prompted a growing number of publishers to consider hiring fresh faces to help restore the vigor of the industry in an era of unceasing and perplexing digital challenges. While I couldn’t agree more that newspapers need new thinking, it’s hard to imagine how many candidates could check all the boxes on the above list. How likely is it that someone with 15 years of senior management experience in and out of the newspaper business would also turn out to be a totally happening social-media dude? So, publishers plunging into the uncharted end of the talent pool need to be realistic and thoughtful about what they really want. Which brings us back to the intriguing selection of Mark Thompson as CEO of the NYT. Though Thompson readily fills the bill as an outsider to the newspaper business, he also faces a daunting learning curve in his new role as the top non-family executive at the nation’s newspaper of record. The good news about Thompson is that he, as a lifelong employee of the BBC, is no stranger to globe-straddling, tradition-laden and self-important journalistic institutions. He also is evidently well equipped to deal with politics in and out of the office, having endured “three chairmen, three prime ministers and five secretaries of state” in his eight-year run as chief of the BBC, according to his announcement last spring of his intention to resign after the Olympics. Thompson’s appointment at NYT was disclosed shortly after the torch passed to Brazil and he was scheduled to start work in November. The other good news about Thompson is that he oversaw the development of a host of new digital and broadcast products at the BBC while presiding over the greatest number of budget-forced layoffs in the history of the tax-supported network. Given the state of the U.S. newspaper industry, the knack for doing more with less is a highly relevant job skill. But there are some notable deficiencies in his resume: He never has worked anywhere but the BBC, he never has worked in the United States and he never has worked at a for-profit media company. The last issue is the most significant, because the biggest challenge facing the Times and every other publisher is devising new business model(s) to replace the generations-old one that has been utterly shredded by the digital media. Although Thompson may be a smart and seasoned executive who can learn what he needs to know in the fullness of time, he doesn’t seem to be nearly as plug-and-play of a selection as Laura Lang, who was recruited from the Digitas ad agency late last year to become the CEO of Time, People, Sports Illustrated and Fortune. While Lang never wrote a magazine article or sold a magazine ad, the Wall Street Journal reports that her 12 years at Digitas were devoted to transforming the company from “its roots in traditional junk-mail marketing” into a business providing targeted online advertising and social-media campaigns for such major corporate clients as American Express and General Motors. In other words, Lang actually participated in the invention of modern digital advertising, the discipline to which all legacy publishers must adapt – or else. Lang walked in the door at Time Inc. with the instincts and insights of a digital native, not to mention a thorough understanding of the needs of the customers she now hopes to serve. For all Thompson’s abilities, it will take serious on-the-job training before he catches up to Lang. Unfortunately, that will take precious cycles away from the time he urgently needs to refurbish his new employer’s business model. The lesson in this for publishers is not to avoid hiring outsiders, but, rather, to choose wisely.